The Fountain Of Life Tabernacle was built and pastored by Rev. James E Banks until his death in 1995. His wife Rev. Anneitta Banks has pastored the church ever since. Album photo for "It's Prayer Time"
Anneitta E. (Holliman) Banks was born February 18, 1928 in Gulfport Mississippi. She was the last of twelve children born to John and Meccolena Holliman. Early in life, at about six or seven she began to sing and play the guitar. This would later become one of her greatest ministries. "Anna" began to feel the call of God in her twenties. She would go to the local prison and local rest homes and sing and minister. She became popular as a local gospel singer. For several years she had her own program on Sundays with a local radio station. She also made public appearances that put her among very famous people, but Jesus was her calling and her life. In 1959 she married Rev. James E. Banks and in 1966 God spoke to Brother Banks to "go to the highway and build for God a house". The hand of God was mighty upon them and they worked and ministered together and completed this great commission from God. In 1993 Brother Banks became ill and Sister Banks ministered continually to his needs. 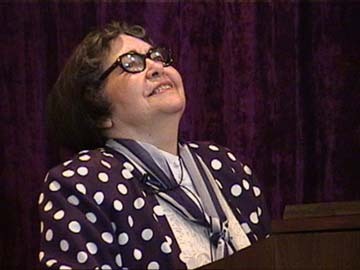 In late 1994 Sister Banks was by his bedside when God spoke to him that it would be necessary to set her in as the pastor of the church. He laid his frail hand upon her head and did so. In January of 1995 Brother Banks went on to be with Jesus. Sister Banks has pastored this work on the highway ever since. She would invite you to come and witness for yourself the great calling of God.